January is the height of our Australian Summer holidays, and the Gold Coast is extremely popular at this time of the year. Find out everything you need to know about visiting the Gold Coast at this time of the year. January is our peak Summer holiday time and finding places to cool down, especially in water is a must! Australia is on holidays and the Gold Coast is one of the main Australian summer holiday destinations for families. It is a HOT and humid summer month. Being by the beach or near water are a must at this time of the year. The temperature and humidity are high and it's nice to be able to cool off in the surf or a pool. When the beach gets too much - there are always the theme parks! Wet n Wild and WhiteWater World are two great theme parks for this time of the year. Sea World has access to the water park in Sea World Resort and you can pay an entry fee from Sea World to gain access to the water park for the day. Or you can get wet in Castaway Bay! The water park at Sea World plus the great pools and water play areas are a great excuse to stay at Sea World Resort. 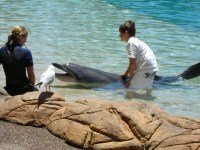 At Sea World you can book a swim with the sharks or a dolphin experience, along with other behind the scenes tours. No experience necessary, just bring your togs and towel, but you will need to book ahead. Family holidays aren't the only reason visitors flock to the Gold Coast in January. Check out Magic Millions Horse Racing Carnival. All the glamour of a premier Australian horse racing event - with lots of off racecourse activities around the coast. Or visit later in January and celebrate Australia Day (26 January) in true Aussie style! January is one of our busiest months on the Gold Coast, theme parks and attractions are busy and the best accommodation is often booked out a long way in advance. Read on for more information about visiting Gold Coast during January. All the information below is updated each year to keep it current. I recommend, if you haven't already, that you get a copy of my planning cheat sheets. Use the information on this page to fill them in, to help plan your holiday. In the table below are averages for various weather indicators for Gold Coast in January. Click here for current weather information in Gold Coast. Hot, humid, rainy season, possible tropical storms in late afternoon early evening. Average 13 rainy days per month and with 12% of annual rainfall during this month. Rain generally falls during the summer storms which include thunder, lightning and form during the late afternoon. Bring an umbrella or rain jacket, but you won't be cold! What's On In The Gold Coast In January? Australia Day Celebrations – on Australia Day 26 January. Public holiday may not be on the same day if it falls on a weekend. More events and dates for January events on Gold Coast. Peak summer vacation season, especially for families with children. To get the accommodation and hire car you you want you will need to book early. If you plan a spur of the moment trip, you may not get your first or even second choice. This month it definitely pays to plan ahead. This is not my top pick of months to visit for overseas visitors, unless you want to see the Magic Millions or cannot travel at any other time. Why? Mostly because it is very busy and very hot! There are better times to see the Gold Coast if you have the luxury of that choice! I cannot stress enough that an absolute must is good quality, air-conditioned accommodation in a good location. You will need to book early, as it is peak season. You will need to make sure you book your hire car early too, as they can become scarce at this time of the year and you might not get what you want. Some top picks for accommodation would be a good hotel, top quality villa or well-positioned apartment. Surf with the pros at Nobby's Head or take a surfing lesson at beaches in the Gold Coast. Catch the latest at Jupiters Casino (now known as The Star Gold Coast) - Check out all the live entertainment for Gold Coast. Your Questions About Gold Coast in January? Do You Have A Question About January In The Gold Coast.? Ask a specific question about January in the Gold Coast, Queensland or Australia is and I will try my best to point you in the right direction.